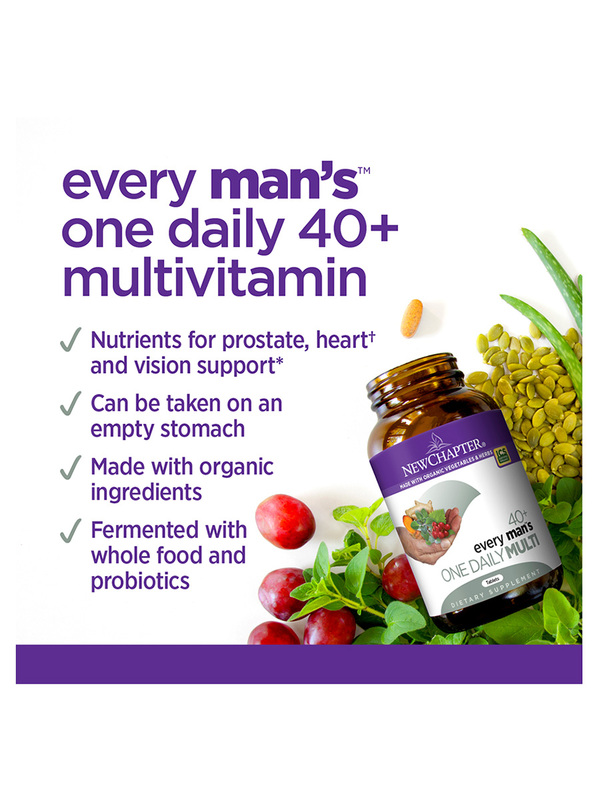 Husband loves Every Man One Daily 40+ Multivitamin by NewChapter, is a natural top vitamin that is organic. 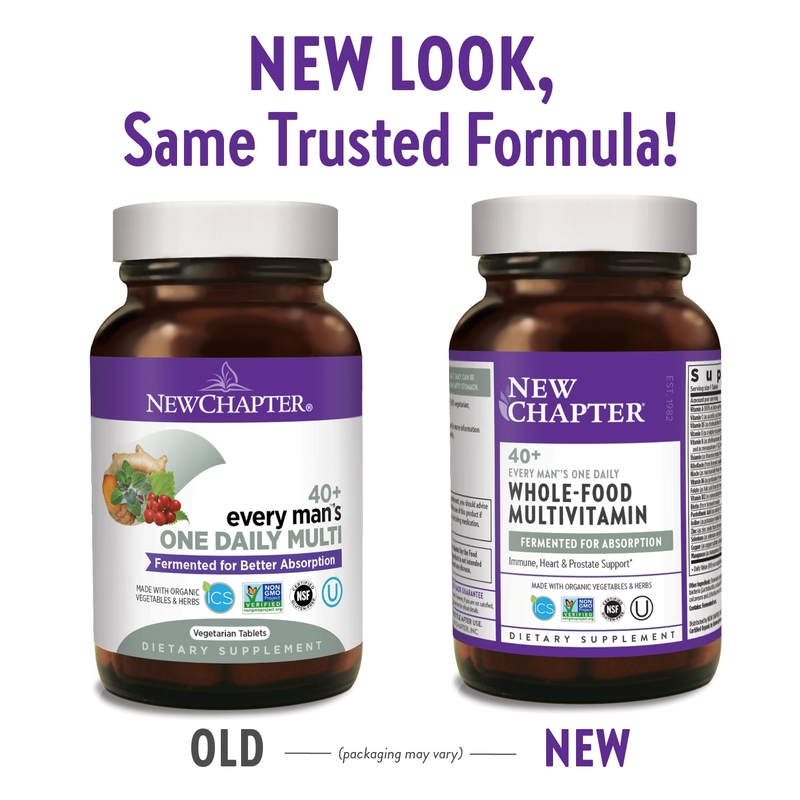 Every Man®'s One Daily Multivitamin 40+ by NewChapter is at a good price and is healthy multivitamin for my husband. It works. 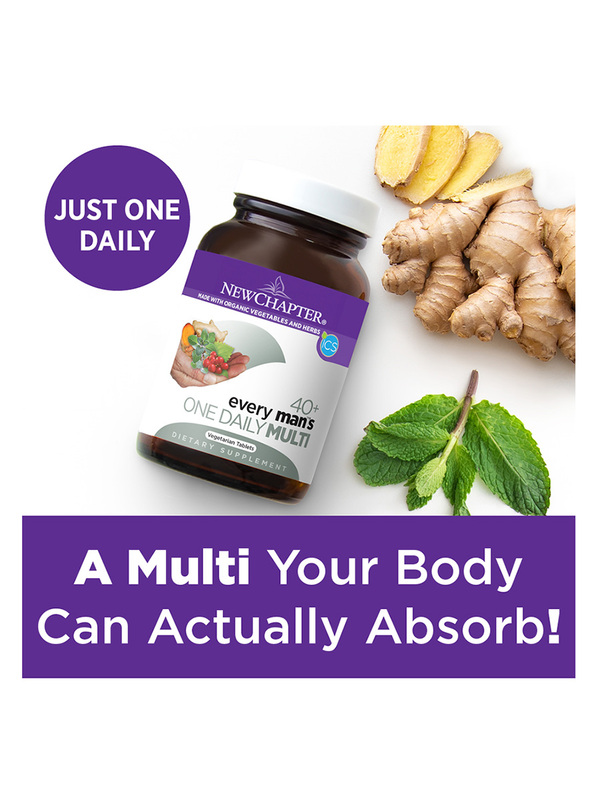 My husband has experienced increased energy since taking these Every Man's One Daily 40+ Multivitamin by NEW Chapter theres no more afternoon slump. 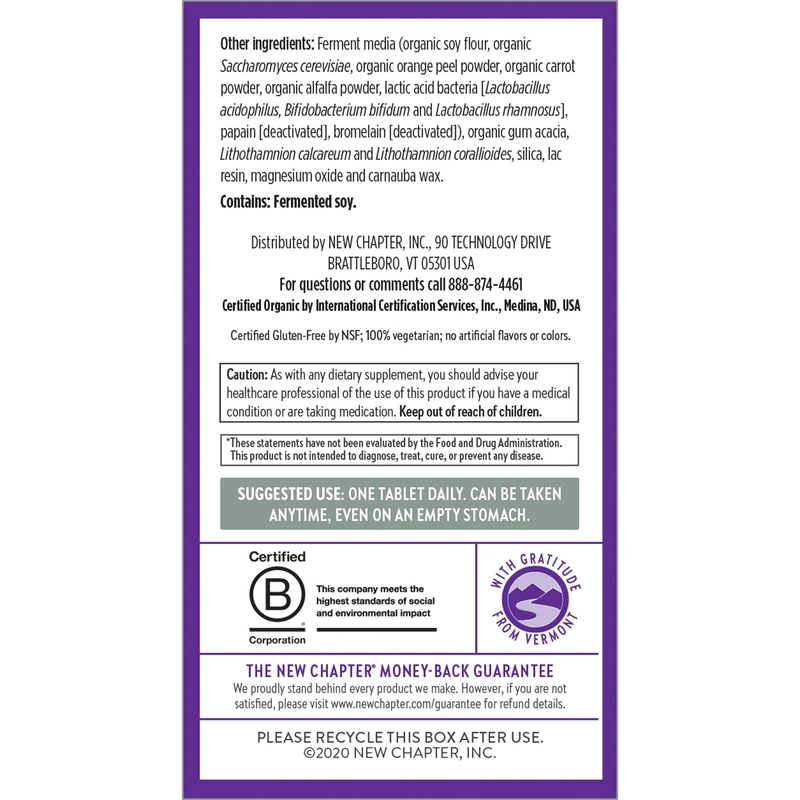 Organic herbs and cultured whole-food complexed vitamins and minerals promote optimal health and condition-specific benefits‚ not just address nutrient deficiencies. 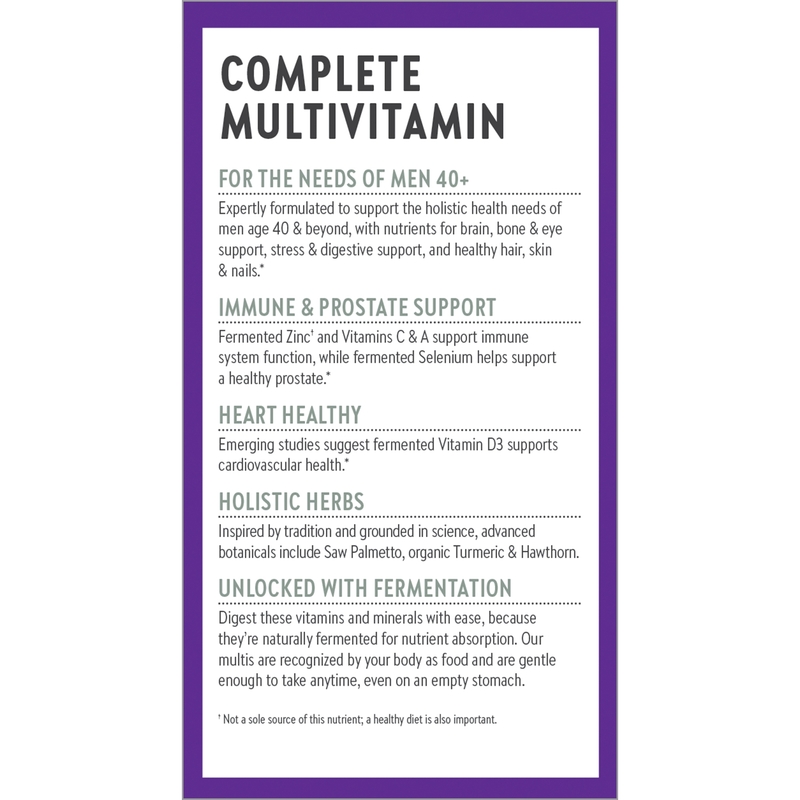 Each tablet delivers safe and sound potencies of 23 vitamins and minerals‚ including Vitamin A‚ Vitamin C‚ and Vitamin E.
Whether you’re a man over 40‚ over 50‚ or beyond‚ this whole-food complexed multi-vitamin is formulated specifically for your needs. 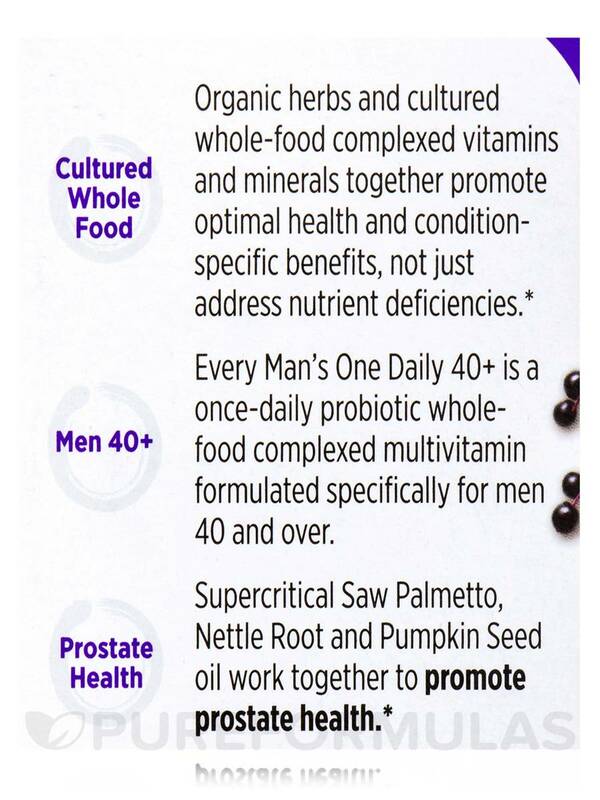 For holistic men’s health support‚ Supercritical Saw Palmetto‚ Nettle Root‚ and Pumpkin Seed oil work together to promote prostate health. 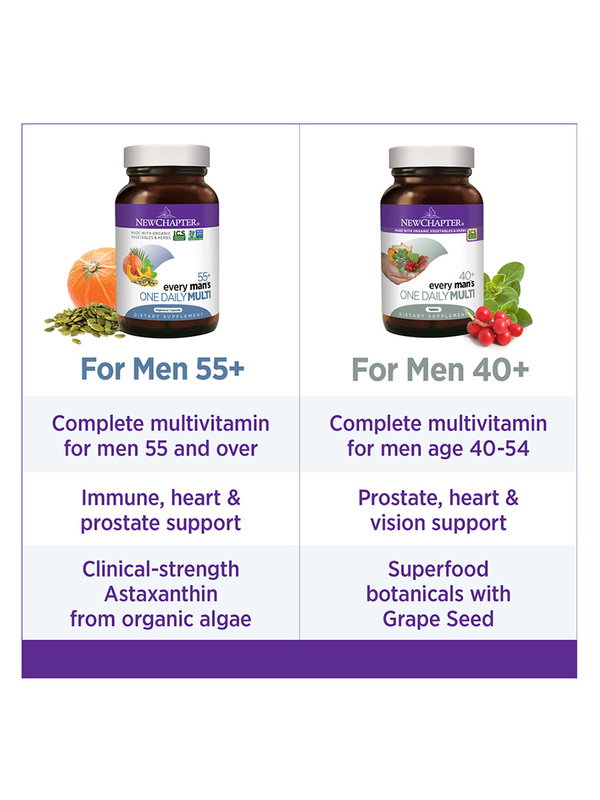 Six whole-food complexed B Vitamins—and whole foods like organic Oregano and Fenugreek—support heart health‚ eye health‚ and digestive health‚ and also help address stress. 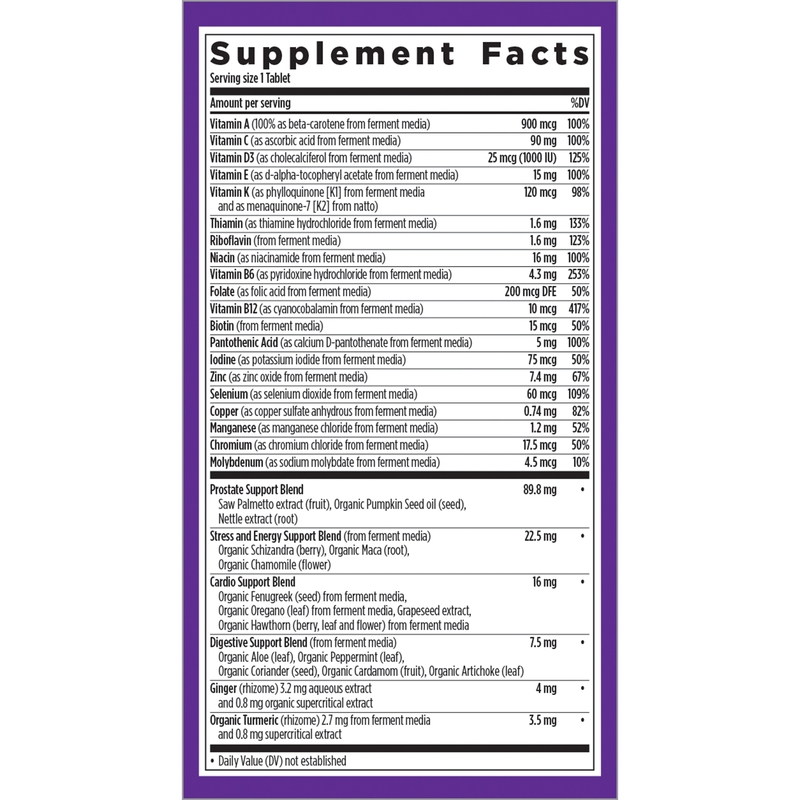 Convenient one a day multi-vitamin formula is easy to take‚ easy to digest and can be taken anytime—even on an empty stomach. ‡ Lithothamnion: (L.calcareum and L.coralliodes). 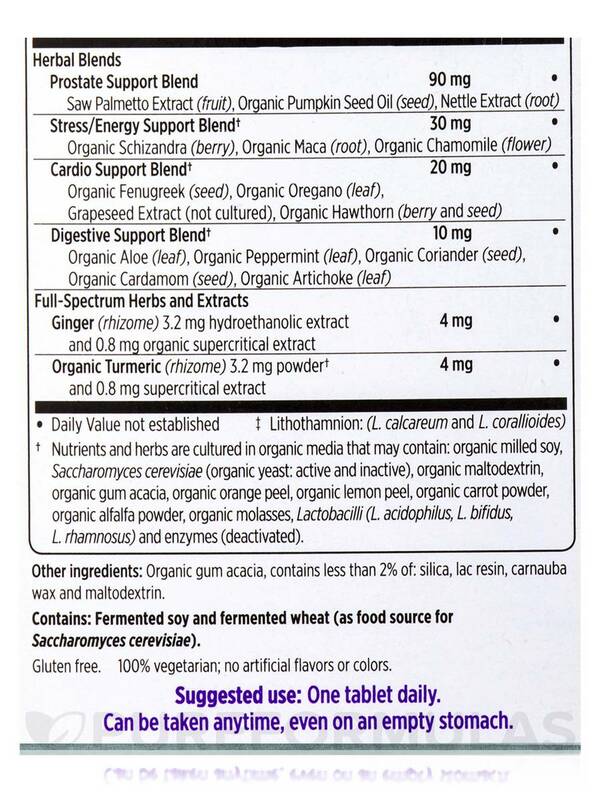 † Nutrients and herbs are cultured in organic media that may contain: organic milled soy‚ Saccharomyces cerevisiae (organic yeast: active and inactive)‚ organic maltodextrin‚ organic gum acacia‚ organic orange peel‚ organic lemon peel‚ organic carrot powder‚ organic alfalfa powder‚ organic molasses‚ Lactobacilli (L.acidophilus‚ L.bifidus‚ L.rhamnosus) and enzymes (deactivated). 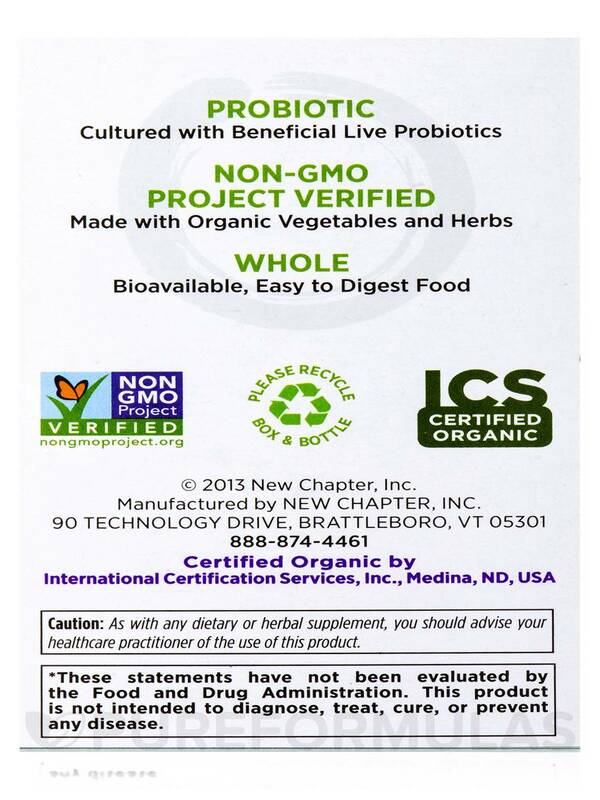 100% Vegetarian; no artificial flavor or colors. A little big for someone who has a hard time swallowing pills. 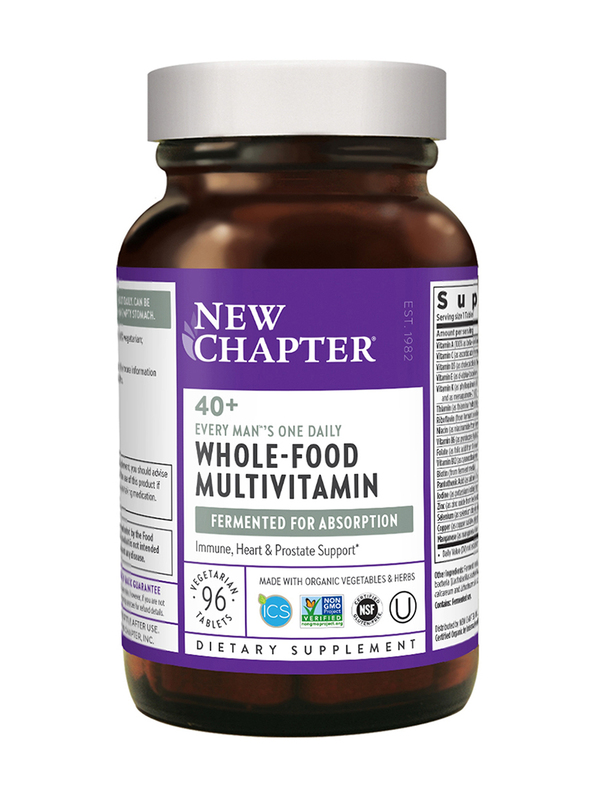 I bought Every Man's One Daily Multivitamin 40+ by NewChapter for my husband who's not into supplements. It's great because it's just once a day and is gentle on his stomach. 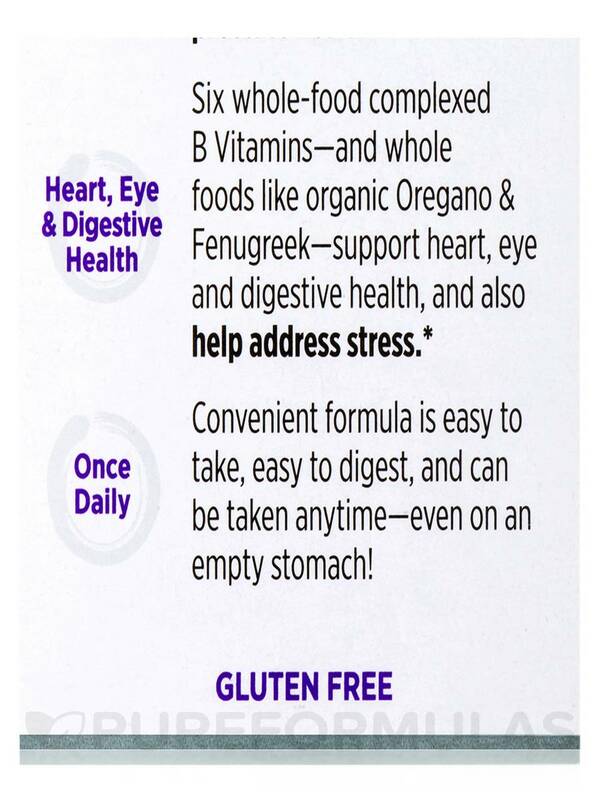 Super convenient - all in one pill!